They came down from Scranton. Took them four hours on a bus. Looking to see escape to warmer weather. Who knew Margaritaville could be found in New York City? On a Wednesday, my mom and I put all of our worries away and escaped the bustling city that never sleeps. We went to Margaritaville. 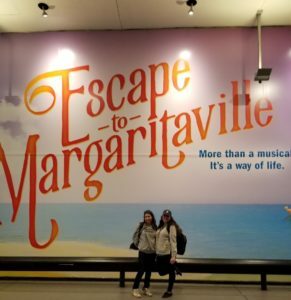 We joined other Parrotheads who attended the matinee showing of Escape to Margaritaville. 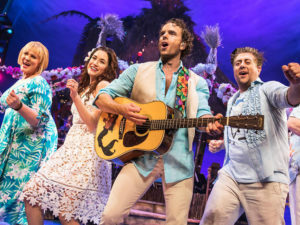 It was an upbeat, engaging, comical production by Greg Garcia and Mike O’Malley featuring music by the one and only Jimmy Buffett. The box office and the entrance to the theater started one’s escape as there were beach balls, paper lanterns, surf boards, etc., providing the ultimate island vibes. If you did not leave the Marquis Theater in a Margaritaville state of mind, you were doing something wrong. There was no such thing as work in Escape to Margaritaville as everyone was on island time. The story was amazing and so were all of the sets. There was a tremendous amount of detail put into the entire production. The plot was a love story–the love parrots meet on the island and although there were forces driving them apart, ultimately their love prevailed. As for the sets, they were realistic, captivating, and well planned for the fast set changes. The beach bar and stage would be an ideal spot to bask in the summer sun. “Swimming” actors were lifted over the stage and right when you thought the escape was coming to an end beach balls fell from the sky and the audience joined in singing “Margaritaville.” However, if you were fortunate enough your escape did not come to an end with the production. Both my mom and I agree that whenever we hear a song now, we have flashbacks to the show. Like when “Fins” plays, we picture the scene where Tammy, Rachael, and… I am not going to ruin it for you. You’ll have to go and see it to find out for yourselves! These flashbacks also often include the accountants…another joke you’ll have to see the show to understand. Overall, the show was one to help you find your happiness and relax. 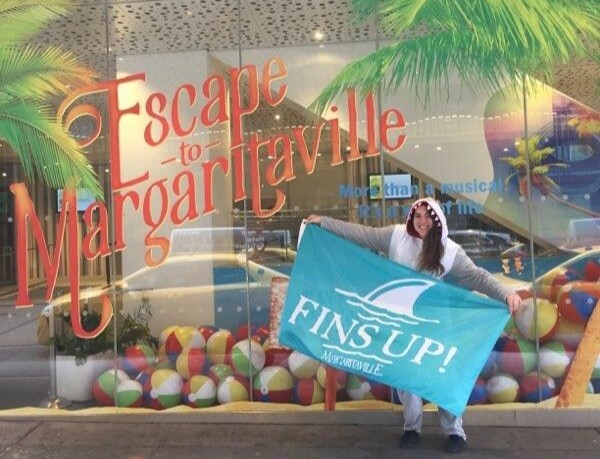 Escape to Margaritaville gives everyone the ability to find Margaritaville and breathe in, breathe out, and move on. Carissa Neary is a Margaritaville college ambassador at Elmira College. Learn more about Margaritaville University here.